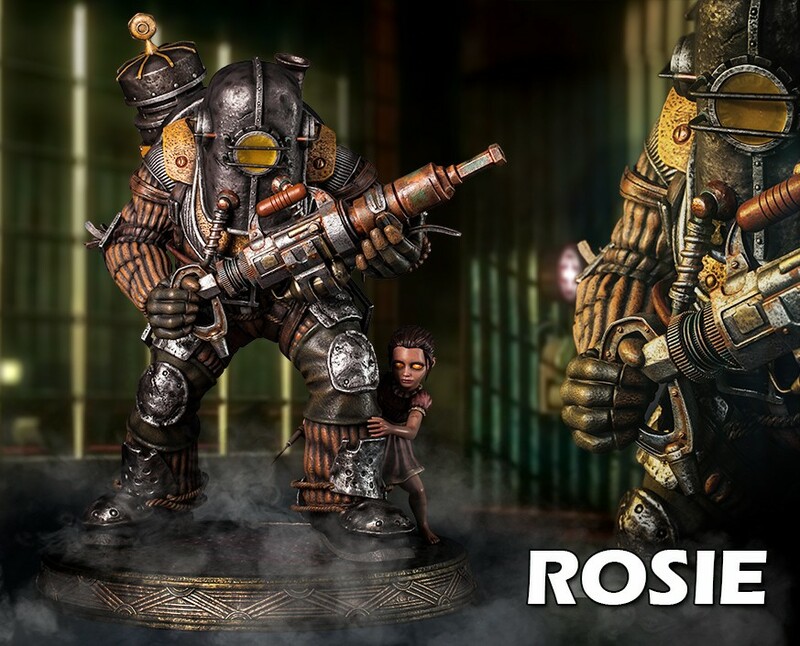 Always seen with its Little Sister, the Rosie is one the of five Big Daddies from BioShock. They are built to protect Little Sisters while they are collecting ADAM. The strong bond between a Rosie and its Little Sister makes the Rosie highly aggressive. Attacking a Little Sister will definitely trigger the wrath of her Big Daddy protector. The Big Daddy - Rosie statue is brought to you by Gaming Heads. Standing in front of a Little Sister, Rosie is depicted in ¼ scale and stands about 21 inches tall. Shielding the Little Sister from any attack, Rosie is depicted in its basic heavy diving suit and holding its signature rivet gun. Each statue has been cast in polystone resin so that it shows the finest of details and it's hand-painted. Each statue comes in deluxe full-color packaging, has a hand-numbered base and a certificate of authenticity, which allows you to purchase the same edition number for future releases in the BioShock range. Since this is the first statue in our BioShock range, edition numbers are given on a first-come-first-served basis. 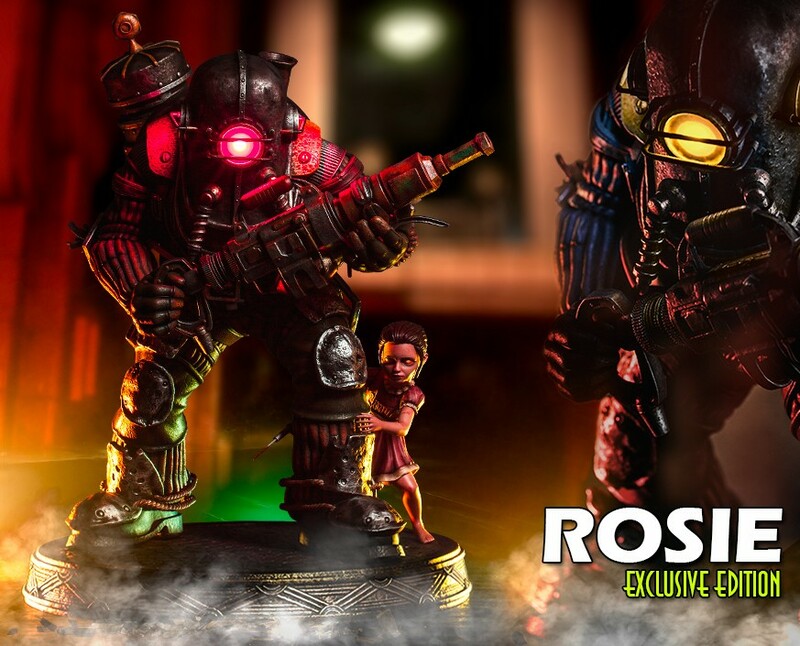 The diving helmet of the Rosie exclusive edition statue incorporates LEDs that change colours (i.e. green, yellow and red). You can choose the colours in Rosie's diving helmet but choose wisely. The exclusive is limited to 500 pieces worldwide and the regular will have 1000 pieces. Visit I and I's homepage! Cross country skiing is great if you live in a small country. • Cancellation fee: $20.00 per scheduled payment. * The amount for the final payment may vary according to discounts and/or shipping charges. Nice. I've seen many requests over the years for someone to make a Big Daddy statue. A lot of people are going to be made happy. Normally I'm against LEDs but in this instance, it's actually a pretty cool idea. This is good news. Especially if this means a new Bioshock line is in the works. Really tempting but wasn't expecting the price tag. Will have to give this some thought. i agree, really awesome! but the price...ouch!!! Is that just a place holder until the months get closer?